According to Seely (1998) “effective use of paragraphing is at the heart of good writing” (p. 256) as a means of structuring a whole text and as a technique for ensuring that the argument flows through the text. He is convinced that if the writer has a clear sense of how the text should break down into paragraphs and understands how to write paragraphs through which the argument of the text flows clearly, then the individual sentences should cause few problems. The role of paragraph is complex. The paragraph should be able to stand alone but normally is not expected to. It must contribute to the whole document, yet it must not be too obtrusive (except when called on to emphasize a specific point). And it should convey only one idea, although made up of several sentences each containing a separate thought. Experienced writers construct effective paragraphs almost subconsciously. We are not so fortunate. We, non-native speakers of English, have to learn the rules and apply them consciously. Good paragraph writing depends on at least two elements: unity andcoherence. If a paragraph is to have unity, it must be built entirely around a central idea, points out Blicq (1993). This idea is expressed in a topic sentence – often the first sentence – and developed in supporting sentences. 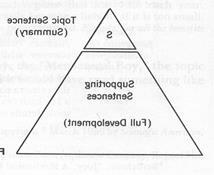 In effect, this permits us to construct para­graphs using the pyramid technique, with the topic sentence taking the place of the summary and the supporting sentences representing the full development (see Figure 1). The topic sentence does not always have to be the first sentence in a paragraph; there are even occasions when it does not appear at all and its presence is only implied. But until you are a proficient writer it would be wise to place your topic sentences right up front, where both you and your readers can see them. Then, when you have experience to support your actions, you can experiment and try placing topic sentences in alternative positions. A good piece of writing is said to ‘stick together’, both linguistically and conceptually. The quality of ‘hanging together’ is known in linguistic literature as the coherence and cohesion. A coherent text has continuity of sense, whereas cohesion has to do with connectivity between its surface elements. Coherence is the ability of a paragraph to hold together as a solid, logical, well-organized block of information. A coherent paragraph is abundantly clear to its readers; they can easily follow the writer’s line of reasoning and have no problem in progressing from one sentence to the next. The sentences must be arranged in an identifiable order, following the pattern that helps the reader understand what is being said. This pattern will depend on the topic and type of the document. In academic writing paragraphs describing an event or a process most likely will adopt a sequential pattern: chronological order, logical order, from cause to effect, from evidence to conclusion or comparison of factors. One of the ways to achieve coherence and ensure a smooth forward movement from one bit of supporting information to the next is the use of transitions: conjunctions and linking words. They help to hold the parts of your argument together and to move the paragraph forward. However, in spite of their indisputable significance, the mere presence of cohesive markers cannot create a coherent text; cohesive markers have to reflect conceptual relations which make sense. Given below are the most commonly used transitional words and expressions grouped according to the kind of signal they give to readers (the list is based on Pogemiller-Coffey, 1987; Mecham 1992). Note: certain words provide more than one kind of signal; moreover, the words in each conceptual category are not always equivalent. To practice the use of transitions, turn to workbooks on the subject. Now, when you have learned how to organize the sentences within a paragraph, answer the questions and revise what you have written. 1. Does your paragraph have a topic sentence? If not, is the topic sentence implied? 2. Does your paragraph have a clear, focused controlling idea? 3. Is your paragraph unified? That is, do all the sentences support the controlling idea? 4. Is your paragraph coherent? That is, are the sentences logically arranged, and do they flow smoothly?